Rebel starfighters at the ready! Super-detailed, action-packed artwork inspired by A New Hope. Each canvas print features artist Bryan Snuffer's authorized signature! Measures 36-inches wide x 14 1/2-inches tall. Rebel Starfighters by Bryan Snuffer presents super-detailed, action-packed artwork inspired by A New Hope. 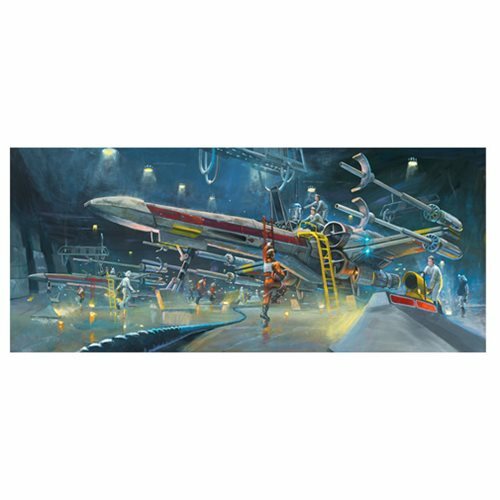 An unframed limited edition of only 175 hand-numbered pieces, this Star Wars Rebel Starfighters by Bryan Snuffer Canvas Giclee Art Print measures 36-inches wide x 14 1/2-inches tall. Each canvas print features the artist's authorized signature and comes with a certificate of authenticity!